Credit: NASA/CXC/Ohio U/B.McNamara et al. When viewed by Chandra, the galaxy cluster Abell 2597 showed a vast cloud of hot gas with two dark cavities - upper left and lower right - about 100,000 light years from the bright center of the cluster. These so-called ghost cavities are thought to be 100 million-year-old relics of an ancient eruption that originated around a massive black hole in the core of a centrally located galaxy. Though dim, the ghost cavities are not completely empty. They contain a mixture of very hot gas, high-energy particles, and magnetic fields - otherwise the cavities would have collapsed under the pressure of the surrounding hot gas. As they rise through the hot gas like air bubbles in water, the ghost cavities may transport magnetic fields to the cluster gas from a disk surrounding a giant black hole. If dozens of these cavities were created over the life of the cluster, they could explain the surprisingly strong magnetic field of the multimillion degree Celsius gas that pervades the cluster. Indeed, there is evidence that the explosion that produced the ghost cavities was not a one-time event. 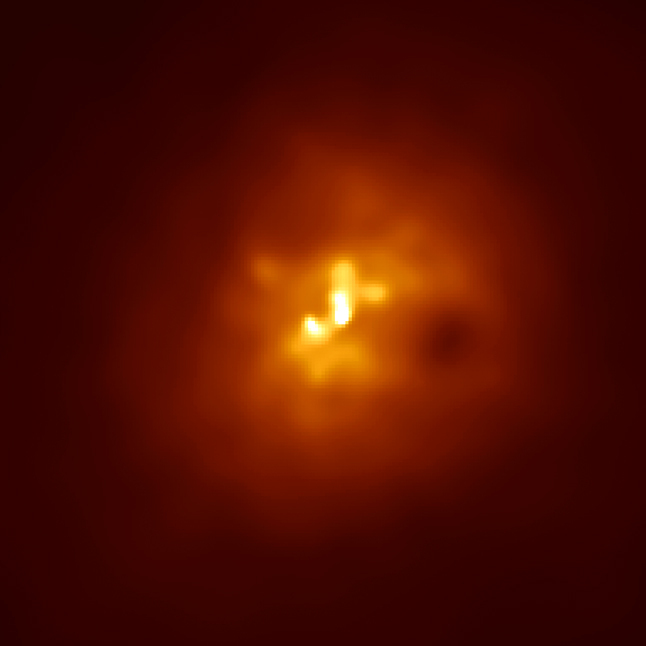 A small, bright radio source near the center of the cluster indicates that a new explosion has occurred recently possibly initiating the formation of new cavities. Credit NASA/CXC/Ohio U/B.McNamara et al. Scale Image is 1.6 arcmin on a side. Coordinates (J2000) RA 23h 25m 19.6s | Dec -12° 07´ 27.4"